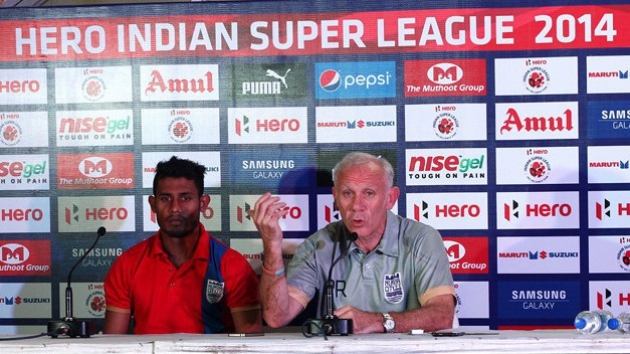 Mumbai City FC skipper Syed Rahim Nabi and manager Peter Reid. Antonio López Habas feels that Atlético de Kolkata will be firm favourites in their inaugural Hero Indian Super League clash against Mumbai City FC at the Salt Lake Stadium tomorrow in spite of the fact that the away side also boasts of a fair complement of local talents. The Spanish gaffer also insisted that he is looking at three points from the game and will not trot out any excuse due to the adverse conditions that his foreign contingent are likely to endure. He also added that the absence of Nicolas Anelka and Freddie Ljungberg in the rival line-up tomorrow will be of no consequence to him as his focus is on his game plan only and not on that of his opponents. He also revealed that Rakesh Masih is down with a stomach bug, which makes him uncertain for the tie. “Other than that, the rest of the team is available and we are going to produce a good match tomorrow,” he declared. 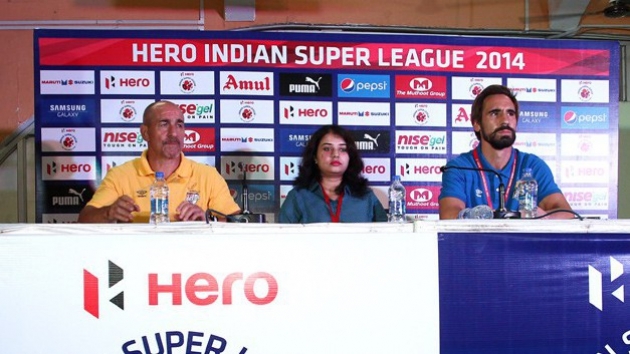 Habas dispelled the impression that Atlético de Kolkata would ape the Spanish style of play, given the number of Spanish players and support staff in the squad. “We want to play in the ‘fatafati’ style, I want Kolkata to play our own style of football,” he said. Atlético de Kolkata captain Borja Fernández stated that he was pretty impressed with the whole way this tournament is shaping up. “The huge population of India and their love for football is going to make this tournament pretty popular in the coming days,” he felt. Mumbai City FC manager Peter Reid revealed that he will not field his marquee player Freddie Ljungberg tomorrow and risk his future in the tournament. “He has had a couple of training sessions in the gym but he still feels the strain in his calf. If we take a chance on this sort of surface and his injury gets worse, it could be a problem for us in the future. So I’m going to leave him out,” Reid said. Atlético de Kolkata manager Antonio López Habas and captain Borja Fernandez at the press conference. Local hero and Mumbai City skipper Syed Rahim Nabi felt that the loyalties of the fans at the stadium would be divided because of the presence of several local players in their line-up though he conceded that fans would also support the home team. Nabi however felt that Atlético de Kolkata would generate a lot of support not only because it is the home team but also because of the fact that Sourav Ganguly is the co-owner and this support could make a difference. © 2015 Indian Super League - All Rights Reserved.